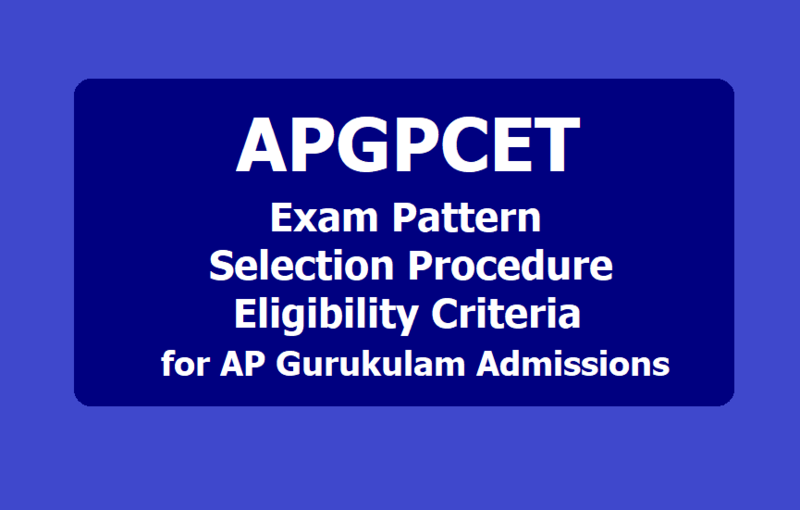 APGPCET 2019 Exam Pattern, Selection Procedure, Eligibility Criteria for AP Gurukulam Admissions: Andhra Pradesh Gurukula Patasalala Common Entrance Test, APGPCET 2019 notification has been released by the APSWREIS Department for admission into 5th Class in all AP Social Welfare / AP Tribal Welfare / MJP AP Back ward Classes Welfare Residential Institutions for the Academic Year 2019-2020. Applications are invited from the eligible 4th class studying students in a Government school or in a school recognized by Govt. Of A.P. for admission into V Class in all APSWR Educational Institutions, AP Tribal Welfare Residential Educational Institutions, and MJPAP Backward Classes Welfare Residential Educational Institutions across the State. b. APGPCET 5th Class Admission test will be held in the subjects’ viz., Telugu, English, Mathematics and Environmental Science based on the State Syllabus of class IV of A.P. State Government. d. The students may choose any one of the center as per their convenience in the State.. The scheme of APGPCET 2019(AP Gurukulams 5th Class Common Entrance Test) is mentioned as under: Examination Timings: 11.00 AM to 01.00 PM - (2 Hrs). a. AP Gurukulam Admission will be given as per merit obtained in APGPCET (5th Class Common Entrance Test) 2019.
b. District wise Merit List will be prepared separately for boys and girls. c. As per the option of the student, seat will be allotted as per the merit and school opted. d. The student may be opted more than one school as per choice. e. The Convener/Co-coordinator has right to reject the admission, if the candidate is found ineligible or the information furnished online application is found wrong. f. If same rank is secured by more than one candidate then priority will be given to the student of higher age. If the age is also found same, then priority will be given to the student with higher marks in Maths. If the age and Marks secured in Maths is also found same, then marks obtained in Environmental Science will be taken into consideration. Age Limit: SC / ST students should have born between 31.09.2006 to 30.09.2010. Qualification: During the year 2018-19 candidates must be studying 4th class in a Government school or in a school recognized by Govt. Of A.P. Annual Income: The parental income should not exceed Rs.1, 00,000/- per annum as per the latest income certificate issued by the competent authority. Nativity:The students are eligible to apply for admission in their native district only. The Native District of the candidate means the place where the student studied for a period of two years in Class 3rd & 4th i.e. during 2017-18 & 2018-19 in schools recognized by Govt. Of A.P. or native place as certified by the competent authority. a. The reservation pattern in all Balayogi Gurukulamst will be SC-75%, SC Converted Christians -12%, ST-6%, BC-5% and others – 2%. The left over vacancies in any category will be filled by SC Candidates as per merit. 78% of seats reserved for ST community including PTGs, OC (2%), BC (5%), SC (12%), and AEQ (3%). The reservation pattern will be EBC/OC-2%, BC-A -20%, BC-B -28%,BC-C -3%, BC-D -19%, BC-E -4%, SC – 15%, ST-6%, orphans – 3%.